Do you have a mouse in your house? If you’ve got one, you can be sure it’s got at least one friend along for the adventure. A pest-ridden house is a headache to many homeowners. Mice aren’t just troublesome, or frightening to some, like many rodents, mice carry diseases and are unsanitary to have in your home. Mice, more specifically their waste, can make allergies and asthma worse. They can also be quite destructive. Mice will gnaw through just about anything, even the wiring under the hood of your car, if they decide it’s a nice warm place to make a nest. 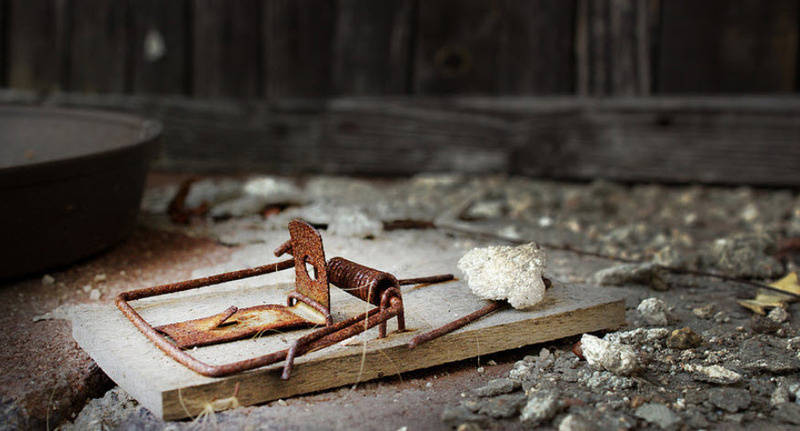 Here are a few things you can do to get rid of mice that get into your home, and that will give you the best chance of keeping them from coming back. The best time to actually see one, since they are nocturnal, is between dusk and dawn. Otherwise, you may notice the trails of little black droppings they leave behind. Another sign is rubbings. As they run along the baseboards, or backsplash in your kitchen, (yuck!) mice leave a smudge. Since mice don’t often vary their pathways between their food source and nest, you get these rubbings, and, of course, the droppings. You may also notice chewed food containers in your cabinets. As soon as you notice any of these, you know it’s time to take action. The first thing to do is find where the mice are entering your home. Keep in mind that a mouse can squeeze through an opening the size of a dime, or even as small as the size of a regular pencil. Cracks under doors, and especially spaces around pipes or vents coming in from the outside should be checked. Don’t forget the attic and the basement. You can block these points of access with door sweeps, caulking, steel wool or mesh – whatever works that a mouse cannot gnaw through. Also, make sure you cut limbs away from your home to keep mice from traveling along them right to your house. Once you’ve closed off any and all access points to your home, it’s time to deal with those mice already in residence. Should I Trap, or Should I Bait? There are pros and cons to both type of remedy. If you feel you must bait, and especially if you have children or pets, it may be best to hire a professional exterminator to do it for you. What do I do if I Decide to Trap? Choose your trap style, then choose your bait. Choose food items mice love, like peanut butter, chocolate, bacon, oats, or even hazelnut spread. You can also use nesting materials, like bits of cotton balls. If you use something moveable, like a piece of chocolate, try tying it to the trap with dental floss or string to keep the mouse from snatching it without getting caught. Also, an often-overlooked precaution is to use gloves to set up your traps so your scent doesn’t get on the traps and deter the mice. Next, place several traps, even different types of traps, along the rodent’s route – where you’ve seen the trails of droppings or smudges. Put them at right angles to the wall with the bait side in, so the mice have to pass over it to get where they are going. If you haven’t caught any mice in an area for two days, move your traps. What can I do to Keep Mice from Coming Back? 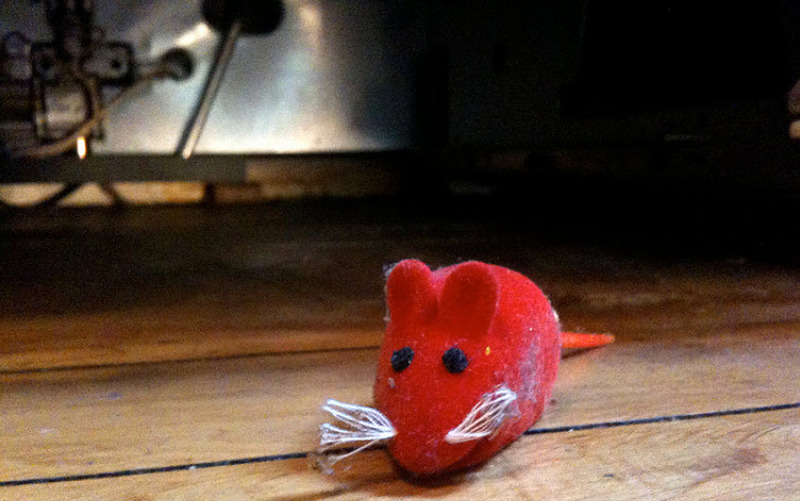 Mice tend to invade during the fall and winter when they are looking for warmth, food and water. Unfortunately, it doesn’t take much to feed or water a mouse and they’ll eat almost anything, though they tend to prefer grains. The best way to keep mice out, after you’ve sealed off the entry points to the best of your ability, is to keep up good sanitation practices in your home. Don’t leave food out overnight. This includes the dog or cat’s food. You also don’t want to leave your produce out on your counters either. Sweep and vacuum frequently to get up any errant crumbs. Really, it doesn’t take much to attract mice. Also, keep your trash can clean and tightly closed. Keep cereals and grains in tight glass or other gnaw-proof containers. So, to sum up, getting rid of mice in the house is more than just trapping or baiting. It’s stopping up all the little holes where they might be entering your home to start with. Then, you have to make sure your home is not inviting to the little scavengers by keeping it as free of temptations as possible.